As best I can tell from my afternoon of Googling (what did we do before Google? 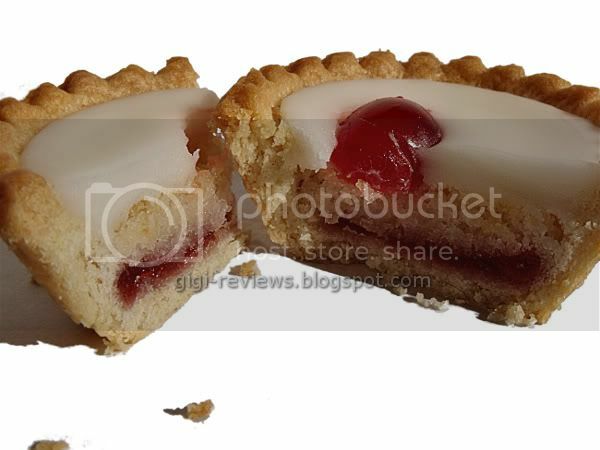 ), Mr. Kipling products are sort of the Entenmann's of the U.K. -- beloved, and found quite easily. This box was recommended to me by one of the very nice saleswomen at The British Emporium (sorry, I can't find a web site for them) in Upland, California. Each little tart is made of an almond-flavored sponge cake, fondant icing, a somewhat confusing raspberry flavored plum jam (why not just use raspberry jam? ), and a half cherry on the top (apparently the only actual cherry in the cherry tart). The photo on the box made each little treat look like it should be the star of tea time, and Mr. Kipling himself -- well, the box, anyway -- says they are exceptionally good. But are they? 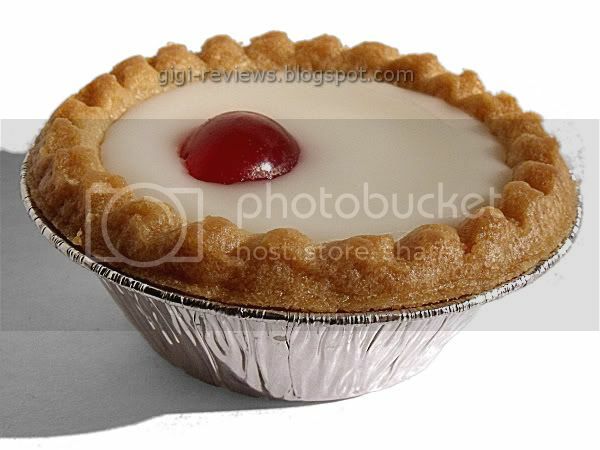 Each tart is in its own individual mini tin, and does in fact look pretty darn similar to the photo on the box. It cuts cleanly, and has the almond-cherry smell of marzipan. Yeah, yeah, but does it taste good? Well, the crust is far more delicate than you might expect. In fact, when you bite into it the tart begins to fall apart. And the crust itself doesn't really have much flavor. The fondant is grainy, and has no real flavor beyond sweet. Eating it on its own made my teeth hurt. The almond sponge cake layer was moist enough, but only had the faintest hint of almond flavor. There is very little jam in the odd raspberry flavored plum jam layer, but what's there is very good and does in fact taste like raspberry. (Is there a raspberry shortage in the U.K. or something?! I just don't get it.) The glacé cherry is...well, it's a glacé cherry. Not much else to say. The texture of the whole thing was terrific. It's moist, it's flaky, it's a little sticky from the fondant, and a little grainy from the jam. I don't think they could improve on that if they tried. As for the overall flavor: It has that mass-produced, industrial taste (or shortage thereof) that one expects of institutional food. Mind you, I wasn't expecting something that came fresh-baked out of an actual tea house. But even with that bland taste,the texture is so great that the only real issue is the forgettable flavors. Not bad, but just barely there. If the flavors were a little stronger, I would be all over these. As is, they are nice enough but not memorable in any way at all. 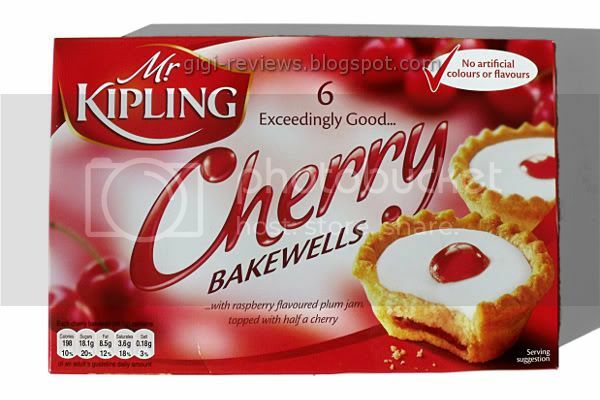 Labels: Almonds, Cherry, Imported, Mr. Kipling, Plum, Raspberry, Snacks, Tarts, U.K.